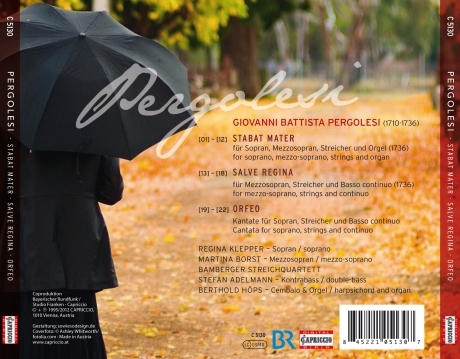 GIOVANNI BATTISTA PERGOLESI is one of those extraordinary musical figures who must be credited both with being outstanding creative geniuses and dying an untimely death. In his life-story, as in his epoch-making work, he has much in common with Mozart and Richard Wagner even spoke of him as a "génie supérieur". What is more, only five years in all were granted him for creative composition before he succumbed at an early age to an insidious tuberculosis. Scarcely anyone, perhaps, has described Pergolesi’s vocal works more splendidly and with more understanding than the philosopher and pedagogue Jean-Jacques Rousseau, author of the Dictionnaire de musique that was extremely widespread in the 19th century, when he wrote: "Here everything contributes to deepening the effect of the text: the harmony serves only to shape it more forcefully, the accompaniment embellishes it without distorting it. in a word, the whole work of art simultaneously communicates one melody to the ear and only one idea to the mind.“ This CD offers 3 Masterpieces recorded by the long time Duo REGINA KLEPPER and MARTINA BORST, accompanied by the BAMBERG STRING QUARTET.